As recognition of their pioneering advances in biotechnology, the National Academy of Inventors (NAI) has welcomed five BioFrontiers faculty to its ranks in the last three years. Marvin Caruthers and Larry Gold now join their colleagues Leslie Leinwand (2016), Christopher Bowman (2016), and Kristi Anseth (2015) in this exclusive club. These distinguished faculty are recognized not only for their leadership in forging new frontiers in biosciences, but also for their noteworthy impacts on quality of life, economic development and welfare of society. All of these BioFrontiers trailblazers have a prolific spirit of discovery, innovation and entrepreneurship that drives them. Implementing their inventions in creative ways to solve real-world problems, they have generated dozens of patents and built numerous biotechnology powerhouses that have transformed the landscape of bioscience research and treatments. Pioneering discoveries in DNA and RNA biochemistry, Marv Caruthers leveraged his insights to develop automated DNA synthesis techniques. These technologies have made bioscience what it is today, by enabling modern genetic analysis techniques. From DNA sequencing, to genome mapping and everything in between, Marv gave researchers the tools required to understand the genetic material that underlies all life. With the explosion of genetic research tools, the pace of bioscience advances has accelerated exponentially. By laying the foundation for these technologies, Marv has empowered academic and industry researchers alike to explore the basis of human health and disease. In doing so, his discoveries facilitated innumerable scientific and clinical advances across all fields of medicine. From the Human Genome Project to next-generation cancer treatments and personalized medicine approaches, Marv’s work has a hand in it all. Now, making similar advances in RNA synthesis, he promises to continue to unravel this new class of biochemical messages that orchestrate biology and disease processes. As co-founder of Amgen and Applied Biosystems, Marv has deployed his inventions to break new ground against bioscience challenges and push the boundaries of biosciences. “My career is devoted to developing new approaches for solving important biological problems using synthetic DNA, RNA, and their analogs,” he says. Among the many honors for his lifetime of achievements, he has received the National Medal of Science, the National Academy of Sciences (NAS) Award for Chemistry in Service to Society, and is an NAS member. "My career is devoted to developing new approaches for solving important biological problems using synthetic DNA, RNA, and their analogs." Larry Gold has called CU Boulder home since the 1970s when he struck out on a career path that has taken him to the frontiers of biotechnology and beyond. At a time when the mysteries of DNA and RNA were just beginning to be unraveled, Larry opened the world’s eyes to whole new dimensions. While the world of these molecules was assumed to be flat, Larry demonstrated that world was in fact round. Discovering that these linear strands folded into complex 3D structures, he exposed biological roles far beyond the genetic messages for which they were known. With this revelation, Larry and his graduate student Craig Tuerk—who Larry says “did the work”—envisioned manipulating and designing these structures, which he called “aptamers,” for bioscience purposes. “We imagined a future in which RNAs were shapes, not tapes,” says Larry. Turning his dream into a reality, Larry spent the rest of his career developing innovative technologies to shape RNA and DNA into tools for medical discovery. Founding biotechnology companies NeXstar and SomaLogic, he channeled his academic discoveries into pioneering medical advances that have had widespread impact. Developing libraries of synthetic “aptamers” to bind cellular proteins, Larry generated high-throughput screens for biomarker and drug discovery. These biochips have proven instrumental in studying, diagnosing, and finding treatments for diverse diseases, from cancers to bacterial infections. They have even led to new classes of drugs against untreatable illnesses, including NeXagen’s own Macugen. A first in treating blindness, Macugen binds to and blocks proteins that cause macular degeneration. Even now, Larry continues to dream up new directions. “The future of aptamers is limited only by our imaginations, as is always the case. Already they are used for proteomics, cell sorting, pathology, affinity purification, and pharmaceuticals. And this is just the beginning.” he says. To drive further innovations, he has created the GoldLab Foundation, which aims to solve today’s healthcare challenges by leveraging biotechnology advances in inventive ways. Larry’s visionary career has earned him an impressive collection of accolades. 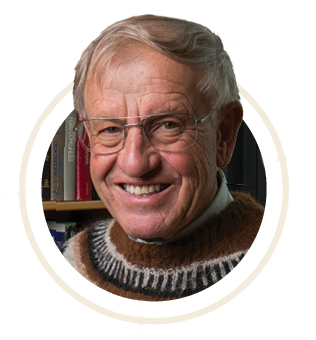 A member of the National Academy of Sciences, he has also received Merit and Career Development Awards from the National Institutes of Health and the Lifetime Achievement Award and Chiron Prize for Biotechnology from the Colorado BioScience Association. "We imagined a future in which RNAs were shapes, not tapes."